August 2nd 2018 UPDATE: The Court has ruled in favour of burying the St. Pierre River. To read Marion Scott’s report, click here. Montreal environmental group Les Amis du parc Meadowbrook recently called attention to a Quebec Superior Court decision ordering the city to clean up a small stream in the west end. We are happy to announce that Sauvons la Falaise has added its name to the list of Montreal non-profit environmental groups endorsing Hands Across Our Green Spaces, a fun and healthy way to support the conservation of Greater Montreal’s wild and natural spaces. Take a peek, get inspired, sign up here! Saturday, June 10 2017 – from 10:00 a.m. to 10:30 a.m. I think a song Paul McCartney wrote when he was 16 may be at the root of a revolutionary trend in senior housing. Released in 1967 on the album Sgt. Peppers’ Lonely Hearts Club Band, When I’m 64 became Baby Boomers’ cheerful, cheeky poke at their parents’ generation. From the strip of walking trails and cycling paths on the shores of the Saint Lawrence River to the well-travelled escarpments of Mount Royal, Montreal is home to several species of birds, animals and plants. Landmarks such as Mount Royal Park and Bois-de-Liesse are well protected, but infrastructure construction and pushes for new housing developments currently threaten some of the lesser-known areas on the Island. To keep Montrealers informed about the endangered bounty at their doorstep, Transition NDG has teamed up with several local environmental organizations. Together, they will host a series of conferences throughout February and March on the premises of Coopérative La Maison Verte. Each of the talks will be followed by a nature walk in the featured area. For more information, see the graphic below. You can also stay informed through Transition NDG’s Facebook page. 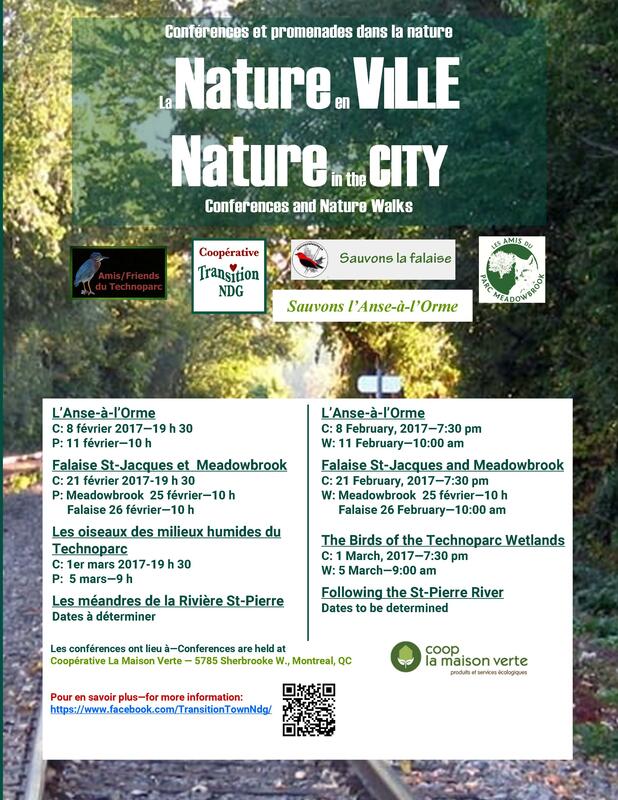 To find out more about the areas that will be featured, visit the Amis du Technoparc Facebook page here, the Les Amis du Parc Meadowbrook website, the Sauvons La Falaise website and the Sauvons l’Anse-à-l’Orme Facebook page. The holiday season is upon us and those of us lucky enough to live in safe, stable countries look forward to celebrating with friends and loved ones. For the person on your list who has everything, why not consider the Give a Gift, Save a Life program developed by the UNHCR? You can find out more about by clicking here. The UNHCR is the Office of the United Nations High Commissioner for Refugees, aka the UN Refugee Agency. It is the world’s leading organization aiding and protecting people forced to flee their homes due to violence, conflict and persecution. It provides shelter, food, water, medical care and other life-saving assistance to refugees around the world. If you are an artist interested in promoting social change, check out Artivists.net, an online platform created to facilitate horizontal communication, coordination and cross-pollination between creative activists working to build a more just and resilient planet. Meet the storytellers, dancers, painters, weavers engaged in imagining, articulating and crafting a new and better world. Inspiration, companionship and the potential for collaborative projects await! Earlier this week, Paul Stacey of Creative Commons published a very interesting article on what a commons based music industry might look like. Inspired by the petition signed by 160 American artists and record labels in support of reform of the Digital Millennium Copyright Act (DMCA), Stacey looks into platforms such as SoundCloud, Spotify, Apple, Google, Tidal and other music services, including Imogen Heap’s Mycelia, a platform dedicated to creating a fair trade music industry. (Access Mycelia here.) Stacey also shares his thoughts on how commons-based thinking might change things. A must read for professional music makers interested in positive solutions to this common and endemic problem. Music and social change are on the menu on August 3rd at 7:30pm at Cecil Sharp House, London for the event A Change is Gonna Come as Heartbeat performs to spread the message of peace. Heartbeat harnesses the transformative power of music, uniting young Israeli and Palestinian musicians and promoting critical awareness to help them become leading voices for change. Through music, young people learn to work together to build trust, understanding and to promote peaceful social change against a deeply divided background. All the money raised at this event goes to Heartbeat and Peace Direct, to support local people who endlessly and courageously work to end wars, build peace and be the change they want to see. For more information, click here.